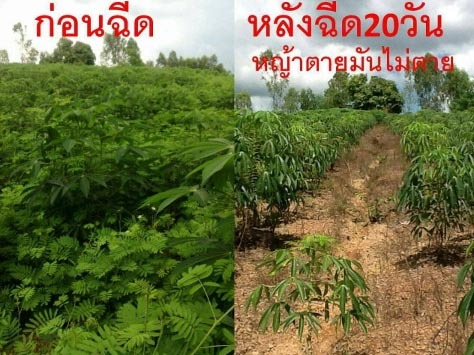 We are proud to introduce "Neutron", an organic plant killer developed in Thailand. "Neutron" is 100 % natural and safe for humans and animals. Even earthworms thrives in soil treated with "Neutron". ​The product is mixed with water and applied on the leaves of the plant with a garden sprayer. After 48 hours is the plant dead. ​- "Formula 1": Kills all plants above the ground (the roots are alive). ​- "Formula 2": Kills all plants, including the roots. - "Formula 3": Kills all plants, including the roots, except rice. Tapioka plantation before and after treatment with "Neutron". Demonstration of the safety of "Neutron": The inventor takes a mouthful and sprays "Neutron" on the grass. The last picture was taken 48 hours later. Left: A field being treated with "Neutron" 28th July 2015. Right: Rice growing in the same field 31st October 2015. Left: Long grass before treatment with "Neutron". Right: 48 hours after treatment.